With sports camera sales on the rebound, which stock makes the better buy today? GoPro (NASDAQ:GPRO) is one of video products developer Ambarella's (NASDAQ:AMBA) biggest customers, and so when the camera maker's business is booming, both companies tend to do well. That supplier relationship doesn't make the two stocks interchangeable as investments, though, and investors can confirm that fact just by looking at the shares' recent performances. Ambarella is up 21% over the last year to outpace the broader market, while GoPro has been nearly cut in half. Sales growth is for the past three quarters. Data sources: Company financial filings and S&P Global Market Intelligence. The sales picture is improving for both companies. Thanks to a well-received portfolio of new consumer devices, consensus estimates call for GoPro to boost revenue by more than 30% in the holiday quarter. Ambarella, meanwhile, just posted its first-ever $100 million sales quarter thanks to GoPro's popular Hero 5 line of cameras. In part because those devices should prove popular with shoppers, Ambarella's management is targeting 26% growth for the holiday quarter for a nice step-up from the prior quarter's 8% increase. Profits tell a much different story, though. Yes, Ambarella's earnings have declined as sales fell and as management poured resources into defending the company's market position. Yet the camera tech specialist is still solidly profitable. Net margin recently dropped to 15% from a high of 28% of sales. GPRO Profit Margin (TTM) data by YCharts. GoPro's earnings, meanwhile, are in deep retreat. The company was forced to slash prices as sales collapsed by nearly 50% over the past nine months, pushing gross profit margin down to 40% of sales from 47% a year ago. Its cost structure was too inflexible to offset that slump. In fact, operating expenses rose 34% last quarter despite the sales decline. As a result, GoPro swung from a $19 million quarterly profit to an over $100 million loss. Investing in GoPro today amounts to a bet that the company can achieve several difficult milestones in succession. The first is a solid holiday quarter that puts its camera devices into the hands of millions of new users. Early indications are positive on this point, as the Hero 5 cameras were the leading franchise in their category over the holiday season, according to the NPD Group. However, it's possible that GoPro had to forgo profits to keep inventory moving, and so gross profit margin will be the number to watch over the next few quarters. If that metric continues slumping, then investors will know that pricing power just isn't holding up to competitive challenges. The real struggles lie further ahead, though, where GoPro will need to slash costs to get its expenses in line with revenue without jeopardizing its brand leadership by skimping on long-term investments like research and development. In contrast, Ambarella has a clearer path to success. Executives have already made progress diversifying into areas like security cameras, home-monitoring solutions, and automotive tech. Growth in the drone market could also lift results, especially given Ambarella's leading offerings that include features, such as 4K resolution and electronic image stabilization, that low-cost rivals can't match. There's a huge valuation gap between the two companies (six times sales for Ambarella versus one times sales for GoPro), but that's a fair reflection of their vastly different risk profiles. 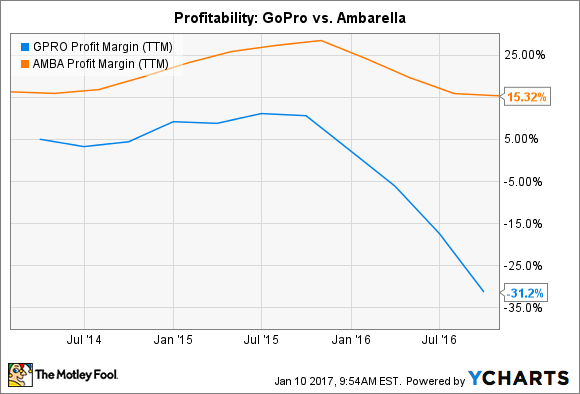 Ambarella's market position seems relatively safe while it's unclear when -- if ever -- GoPro will be able to break out of its profit slump. Thus, investors should only wade into that stock if they're prepared for a volatile ride higher, at best, and at worst, further painful price declines.